At first glance, they appear like swarms of jellyfish, but on closer inspection the mysterious, pale formations streaming from the frozen abyss of a western Canadian lake are far more… explosive. 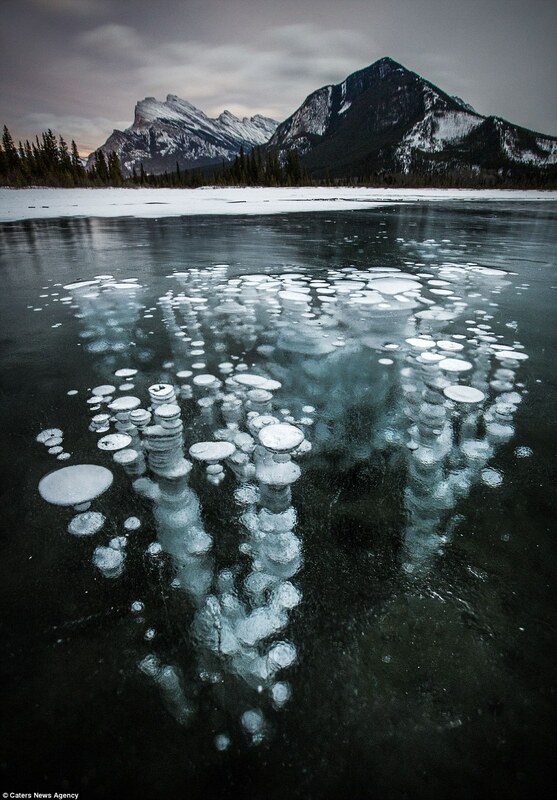 German photographer Lennart Pagel has been blowing minds this past week, with his eerie footage and photographs of methane bubbles frozen in Abraham Lake in Alberta, Canada. Video of the curious phenomenon has already accrued 5.6 million views since it was posted online and it’s easy to see why. Some might see stacks of white pancakes or a fluther of jellyfish frozen beneath the icy surface of the lake, but the strange sight is, in fact, methane bubbles emanating from decaying organic matter buried in the sediments of the lake bed frozen amid a sudden cold snap, which plummeted as low as -30°C (-22°F). Alberta is home to Canada’s vast oil sands, so it is unsurprising that small pockets of methane gas would be dotted across the remote landscape, as well as being trapped beneath this lake. As fortune would have it, Pagel was on hand with some high quality equipment and the technical know-how to capture this stunning site in exceptional detail. According to a recent study in the Netherlands, rising global temperatures release more methane gas from lakes, ponds, rivers, and other wetlands across the world. “A temperature rise of 1 degree Celsius leads to 6 to 20 percent higher emissions of methane bubbles,” researchers from Radboud University wrote in 2017. Methane is a potent greenhouse gas, though thankfully, it is not as widespread as carbon dioxide, yet.